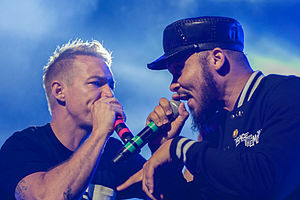 Major Lazer is an American electronic music baund componed o record producer Diplo, Jillionaire, an Walshy Fire. It wis foondit bi Diplo an Switch, but Switch left in 2011. Its muisic spans numerous genres, mixin reggae wi dancehall, reggaeton, hoose, an moombahton. ↑ Dolan, Jon (June 2, 2015). "Major Lazer's New Album: Peace Is the Mission". Rolling Stone. Wenner Media. Retrieved June 6, 2015. This page wis last eeditit on 31 Julie 2016, at 21:27.